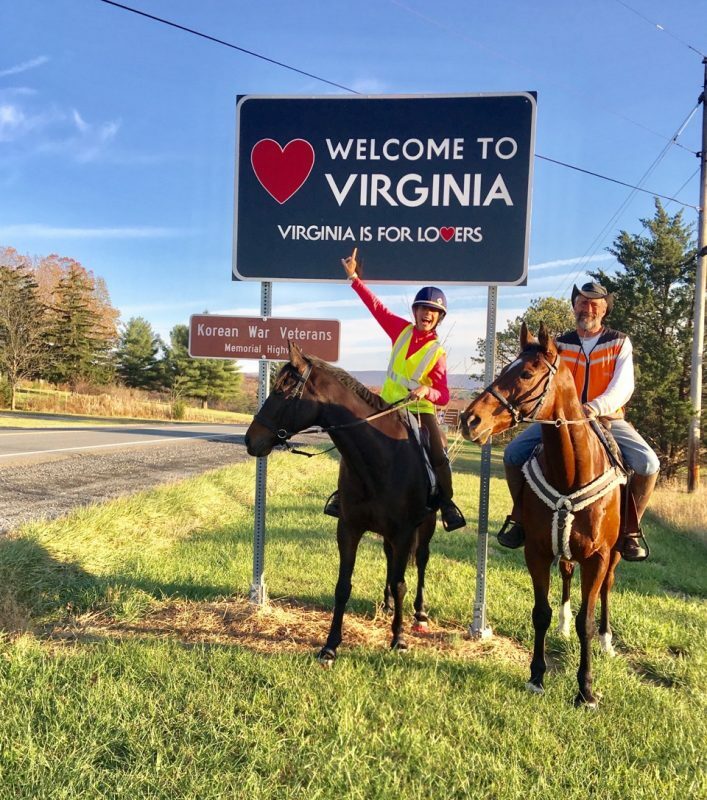 Blue skies and dirt roads beckoned as Peter and Solar Express and Valerie and Primitivo rode from California to Virginia. It sounded like a Hollywood promo for a movie: 60-year-old equestrian and her friend ride two ex-racehorses 3,300 miles coast to coast to prove that off-the-track Thoroughbreds are phenomenal riding horses. It actually happened in 2016 when Valerie Ashker took her passion for OTTBs on the road, literally, accompanied by Peter Friedman, 53. Valerie piloted Primitivo while Peter partnered with her veteran ex-event horse, Solar Express. 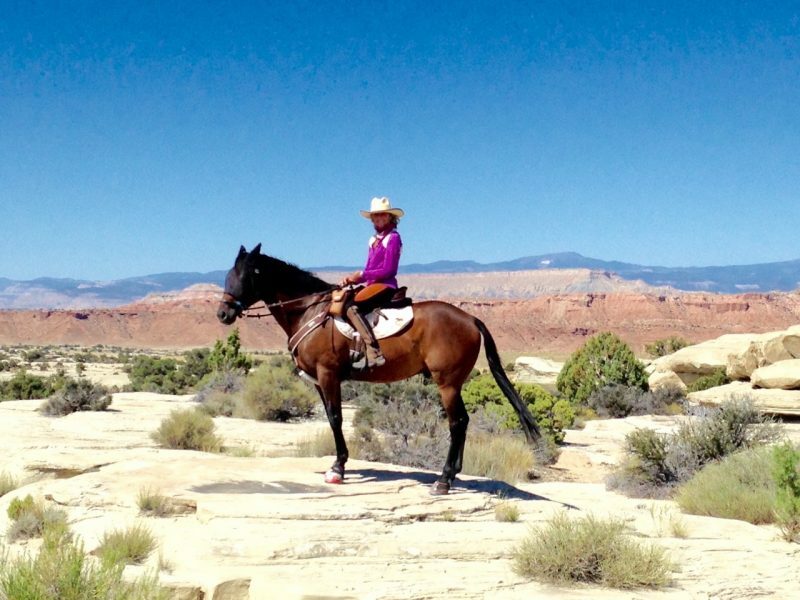 Valerie’s epic 3,300-mile cross-country ride showcased the durability, versatility and suitability of OTTBs as equine partners in high performance, sport, pleasure, trail and endurance. 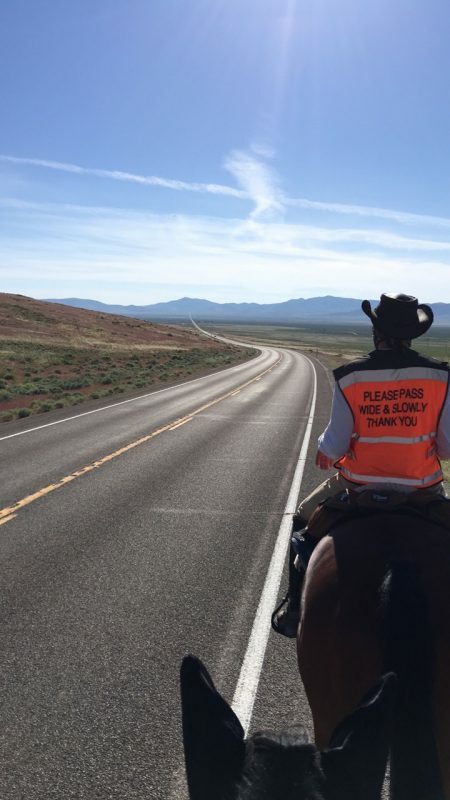 Departing on May 9 from her farm in Georgetown, California, and heading east to Middleburg, Virginia, Valerie chose to ride across the middle of the United States on Route 50. Long ago, much of it began as covered wagon trails for pioneers; today, however, it’s paved and varies from two to four lanes to expressways (which they detoured), and cities that they mostly tried to go around. Valerie takes a photo over Primitivo’s ear of the long road in front of her and Peter and Solar Express. Solar Express and Primitivo, both ex-racehorses, handled mountains, deserts, traffic and thousands of miles. 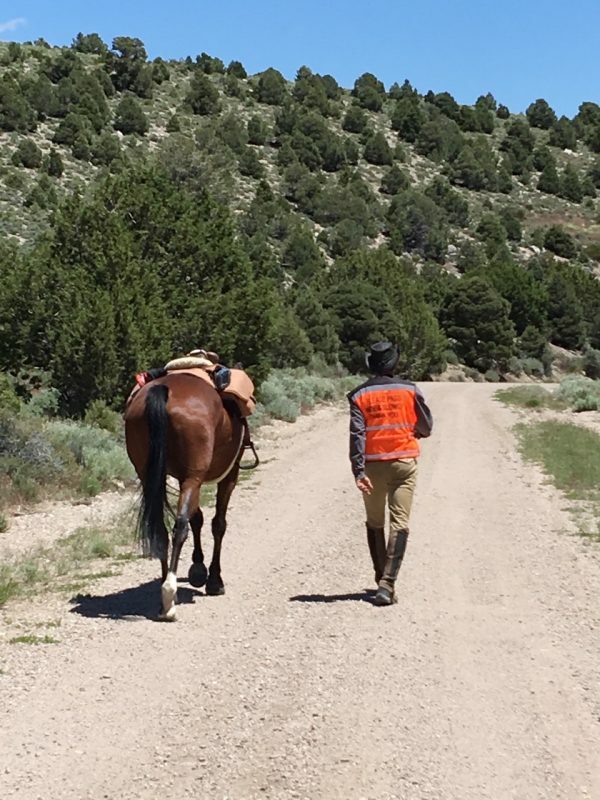 The riders got to see the U.S.A. in a way that few people in this high-tech age ever will: on horseback. The challenge involved overcoming adversity — navigating mountains in the early part of the ride, not always having a chase driver for the truck and trailer so that Peter had to fill in, Valerie’s fall that broke her collarbone and bruised ribs, being re-injured when she was knocked off Primitivo by a road sign while riding and texting, plotting their course to avoid superhighways, figuring out how to tackle riding through Utah, Kansas, and the last bit of the Appalachian Mountains, which are cold in the winter. Any horse that can travel from coast to coast is worth its weight in gold. Many Thoroughbred enthusiasts already know this truth about ex-racehorses: When they’re sound of mind and enjoy their “change of pace,” the sky’s the limit. Valerie credits a lot of people – old friends, new friends, followers on Facebook, sponsors and her parents, George and Lillian Stephenson. She modified the African proverb, “It takes a village to raise a child,” and stated often that “It takes a village — I couldn’t have done this by myself!” True, of course, but even here, there’s a biographical backstory, relevant to her epic ride, which merits being shared. Valerie inherited a great singing voice from her mother, a coloratura soprano, and started performing in bands when she was 17, hitting the road in her 20s for several years with a country crossover group. Eventually, Valerie and Michael, her musician-turned-strockbroker husband, set up housekeeping in the foothills of Sacramento. Of course, she had horses and, after getting pregnant with Laine, rode and competed into her seventh month. Valerie and Primitivo took in some amazing scenery as they crossed the country. Valerie’s goal on the 3,300 mile journey was to prove that off-the-track Thoroughbreds are phenomenal riding horses. Laine was crazy about horses and got her own pony at 3. 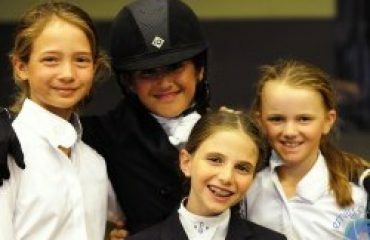 She would join Pony Club, get hooked on eventing and compete in the Junior Olympics, winning two silver and three bronze medals. Meanwhile, thanks to a friend, Valerie was refining her knack for choosing event prospects at local racetracks and getting them rehabbed and re-trained for their first event. Valerie moved to Virginia when Laine was in her teens so that her daughter could be closer to eventing’s hub. 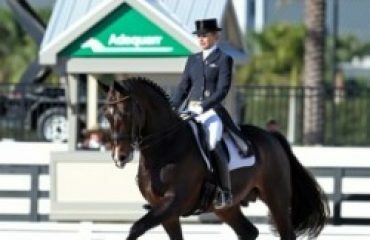 Now 32, Laine competes at the top levels of three-day and also at FEI levels in dressage. Laine recently moved her training operation in Virginia to Keystone Acres near Richmond. Valerie and her horses moved there also. 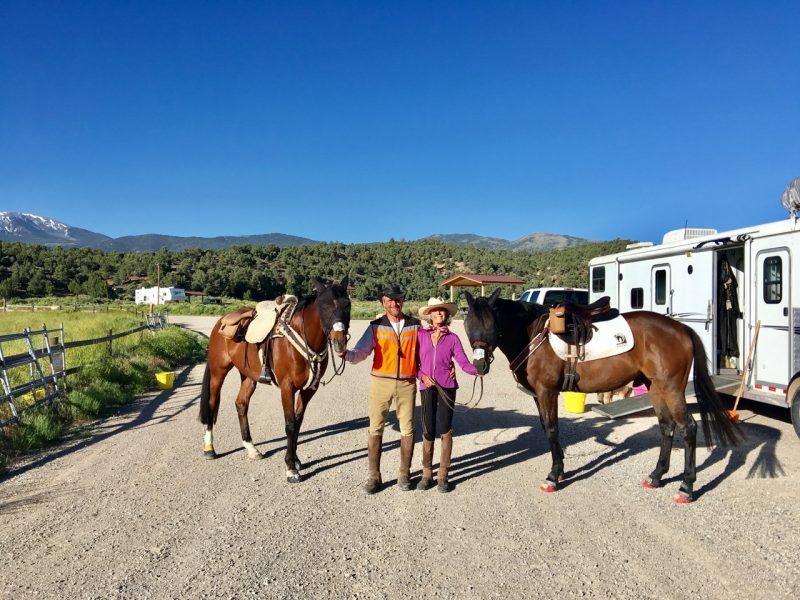 When Valerie decided it was time to give back to Thoroughbreds and do something to promote their suitability as riding and sport horses by riding all the way across the U.S. with her OTTBs, her parents didn’t question their daughter’s sanity. They pitched in and helped in every way — morally, spiritually, and financially. Valerie and Peter pose by the “Welcome To Virginia” sign, on their way to the finish line in Middleburg. Valerie’s parents spent 2 ½ months on the road with her and the horses in three different segments. They drove the truck and trailer for the second part of the trip through Nevada. They flew to Colorado and rented a pilot car in which Lillian went ahead, scouting places to park the rig, which George drove. 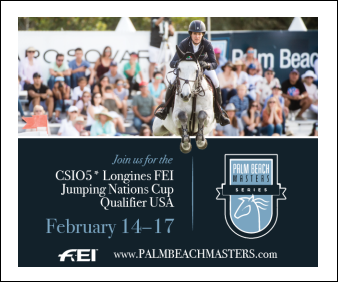 They arrived at the finish line in Middleburg, Virginia, on November 19 — the horses looking fabulous and in superb condition, with plenty of energy for a victory gallop on the track at Middleburg Training Center. They were met with an enthusiastic welcome and reception organized by the Thoroughbred Retirement Foundation and Valerie’s daughter, Laine. There was abundant emotion — joyful tears, relief at the end of a long and grueling trail, and great elation over the superb performance by the elder statesman Solar Express — who led all the way with a relatively green rider — and Primitivo, 7, who behaved impeccably for all his youth with only the occasional silly moment. Peter walks next to Solar Express. Valerie’s epic ride received a lot of attention on social media, especially the Facebook page that Valerie updated with photos and news bits whenever her smartphone had enough signal. 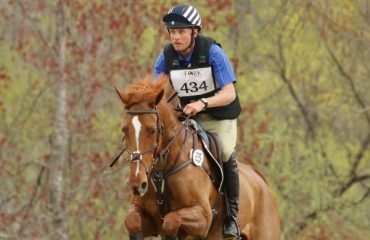 Re-purposing OTTBs begins with a horse with a great mind who’s ready to leave the track and try a new career. 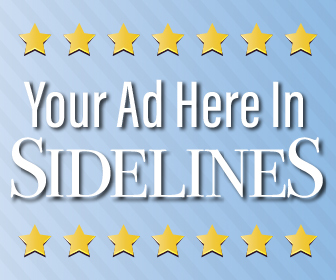 Valerie’s new mission is to educate the general public with a series of candid videos. Note: Valerie garnered invaluable information and practical advice about long-distance riding from Sally O’Connor and Karen Chaton. Sally rode on horseback with her sons Brian, 13, and David, 11, from Maryland to Oregon in 1973 with no chase vehicle, relying on friends and the goodwill of strangers along the way. 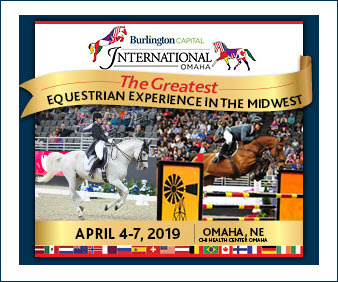 Karen is a veteran endurance rider (37,750 career miles so far) and her Granite Chief+/ (15,130 miles) was inducted into the American Endurance Riding Conference Hall of Fame in 2012. 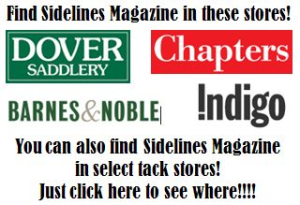 Their experience helped Valerie on every level of horse care and maintenance, as well as common-sense advice for the riders. 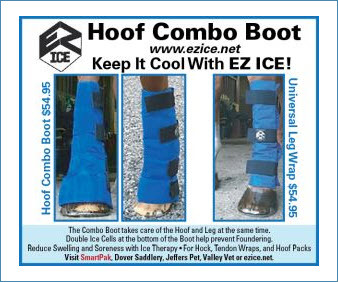 Please do not attempt to ride your horse for long distances without expert advice and proper planning and preparation. 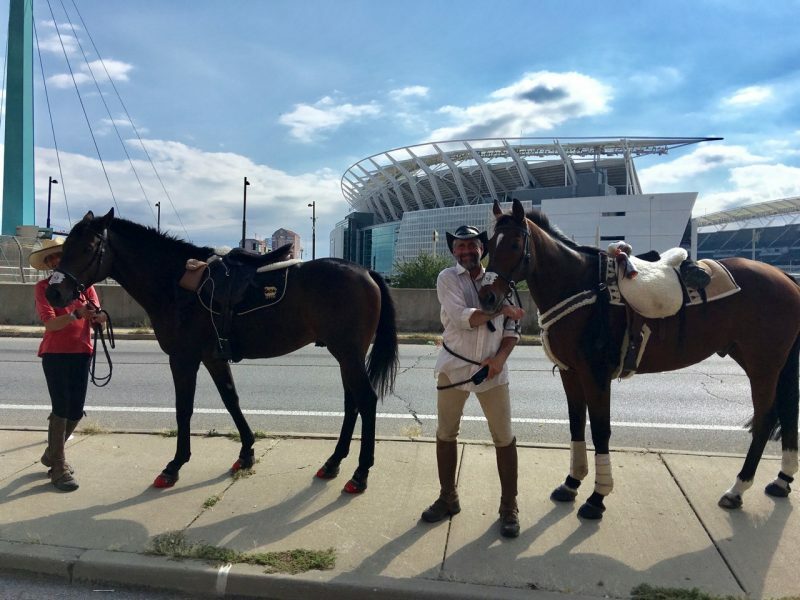 The intrepid cross-country riders and horses in front of the Bengals Stadium, Cincinnati, Ohio.